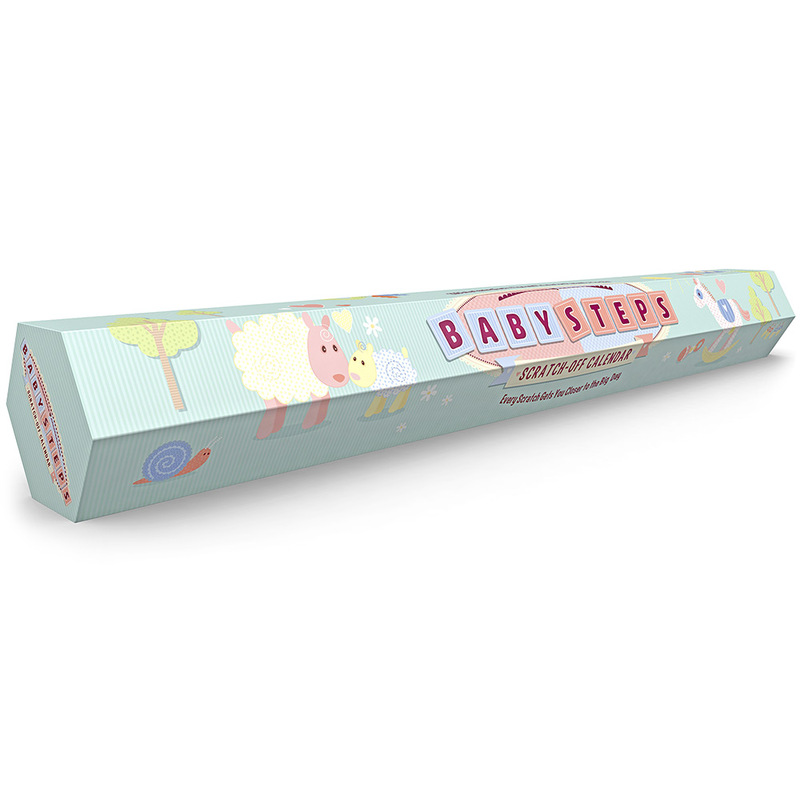 Splash Brands has provided me with an awesome new product, BabySteps Scratch-Off Facts Calendar, that I get to happily pass on to one lucky winner. This product is really unique and is one of those things that you never knew you needed! I wish I would have had one of these when I was having my very first child. This calendar is pretty cool, basically it’s a wall calendar with 236 facts, trivia and tips for parents-to-be, and each day you get to scratch off a fact and learn something new! This is a great gift for any parent-to-be and I can’t wait for one of my lucky readers to win one! To win this amazing giveaway, please comment below with why you want this calendar and who you would give it to. I will choose one lucky winner on Monday, February 15, 2016. Winner will be notified via email and will have 2 days to reply back to me. If I don’t hear back from you within 2 days I will choose another winner. I love brownies so very much! My two favorite renditions of brownies are mint and s’mores. When my mom makes her homemade peppermint brownies I cannot deny a bite (or two or three…). I also have a huge weakness for s’mores flavored anything and if they are s’mores brownies I’m sunk! I love s’mores, one of my favorite summer desserts – I’ll look for any excuse to roast marshmallows and then to combine that with a brownie?! Oh my! I would not be able to turn them down! This month I’m featuring an awesome recipe on Pinterest of a S’mores Brownie. I’ve not had the chance to make these yet, but I know they will be amazing! 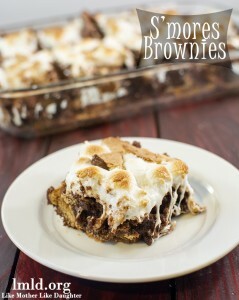 Check out these yummy S’mores Brownies from Like Mother, Like Daughter, don’t these look so good? Are you one of those moms that does too much because you have children that don’t do very much. Make it your goal to work yourself out of a job. If a child can play a game on your iPad, he/she can help with chores. Now doesn’t that hit you like a ton of bricks? When I first read this, I was in total agreement. It’s so true. Sometimes, we as moms, do way too much for our kids. You know how it goes, your oldest child might tend to spill too much so it’s easier for you to pour the milk for cereal rather than letting him try, spill, learn, and you’re on your way out of a simple job. I’m totally guilty of this. I hate messes, so I tend to do way too many little jobs for my kids just to make sure there is a not a huge mess to clean up afterwards. But I know I’m just making my job as a mom harder in the long run. Kids need to learn to help even if it makes a bigger mess. Confession time…when I was a kid I remember my mom making me and my brother do a lot of chores around the house. The worst one of all was dusting and I had the lucky job of dusting this curio cabinet that had glass shelves. I had to take every single little Precious Moments figurine that my mom collected off each shelf and make sure the shelf was dust free. This job was so awful! It was meticulous and took what seemed like FOREVER to do. The worst part to doing a lot of my chores as a child was that even though I ‘thought’ I was doing a really good job as a 10 year old, my mom would always come along after and redo whatever I had just done, because it wasn’t done as good as she would have done it. It always used to really drive me crazy – I never could figure out why I needed to waste the time doing the chores if she was just going to redo them anyways. I catch myself doing the same thing to my kids. Why??? I have no idea, except that I’m a crazy neat freak. But I’m trying really hard to not redo their work anymore. I’m trying very hard to remember how old they are and what their actual abilities are and then asses their level of efficiency and effort. Your kids absolutely should be helping you around your house. They live there for free – so they should pitch in and help! So the next question becomes, what chores should your kids do and should you pay them to do those chores? Here’s what I think. Yes, yes, yes! I’m a big Dave Ramsey follower and we love his ideas on kids and money! Dave believes that you, as parents, are the boss and your kids are your employees. As a boss your kids work for you, and they should earn commission. When they work, they get paid. When they don’t work, they don’t get paid. Simple as that. It works too! It also teaches kids the value of money. Rather than just paying them because they breathe, this forces them to equate working hard for the money they want to spend on fun things. This idea works really well when your children are old enough to really understand what their money can buy them. We have three kids, ages 4, 6 and 9 right now. We started doing commission for chores when my oldest was 4. At that age he did very simple chores and was paid at the end of each week. From his weekly commission earnings he would then distribute that between three different envelopes for Giving, Saving, and Spending. We have taught all 3 of our kids these concepts and they each have a list of chores based off their ages and abilities that they earn commission for. 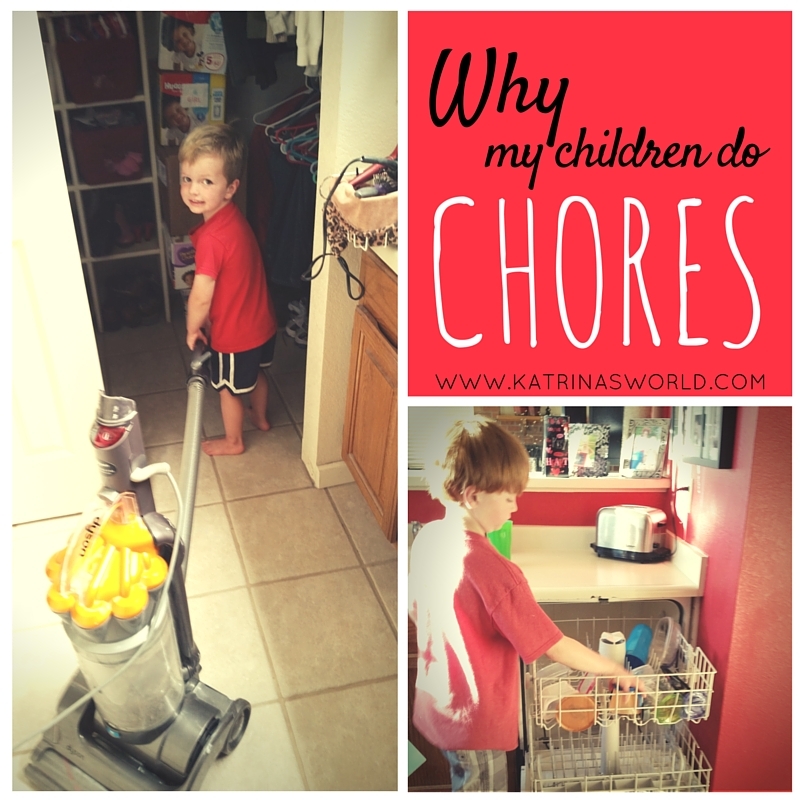 This process forces the kids to see chores not so much as a chore, but as a job they can earn money for. When there is a special toy they want to buy we often have some requests for extra chores in order to earn bonuses, and sometimes they do business deals with each other - getting paid from a sibling to do their chore! It’s great! To a mompreneur like me, I love seeing business deals happen with my young children (and so far, they have been very fair)! 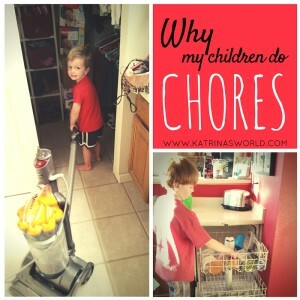 Do your kids do chores? What ages and chores do they do? Do you pay them? Would love to hear what you have tried and what works for your family! Hugs to all! Since it’s the beginning of a new year, it’s that time when all your friends and business associates on Facebook are writing out deep thoughts and aspirations about all the amazing things they plan to do in the new year. I don’t know about you, but this year I’ve not wanted to think too deeply about goal setting. I’ve not wanted to jump on the “my plans for the upcoming year” bandwagon, and here’s why. Last year, not a lot went how I had “planned” it to. I didn’t reach very many of my big goals, let alone, my easy-to-reach goals. Which is so not me. I tend to make big goals and hit them, and if I don’t hit them I absolutely hit a whole bunch of my easier to reach goals on the way. So this new year, I’m dragging my feet to even think about my goals for the year. I know that comparison will kill my joy, but gosh it’s really hard to not compare where I’m at with those around me. I see my happier, healthier, skinnier, wealthier friends around me and I can’t help but compare. Her smaller waist and brand new SUV, and she just dropped off her well-groomed son at an awesome preschool, to my bed-head mis-matched son who rides in my recently door dinged older SUV, to drop off his siblings at school with a mommy who LOVES chocolate and ate way too much of it over the holidays because she wasn’t feeling all that well….yep, it’s my story. As you can see comparison is killing all my joy, especially if I don’t look at the whole story. Who knows where my friend is on her journey. Maybe she has been starving herself for months just to fit into that new outfit, and maybe her brand new SUV was purchased with money that she’s been saving for years, and maybe her in-laws wrote the check for her son to attend that preschool…who knows what her story is! 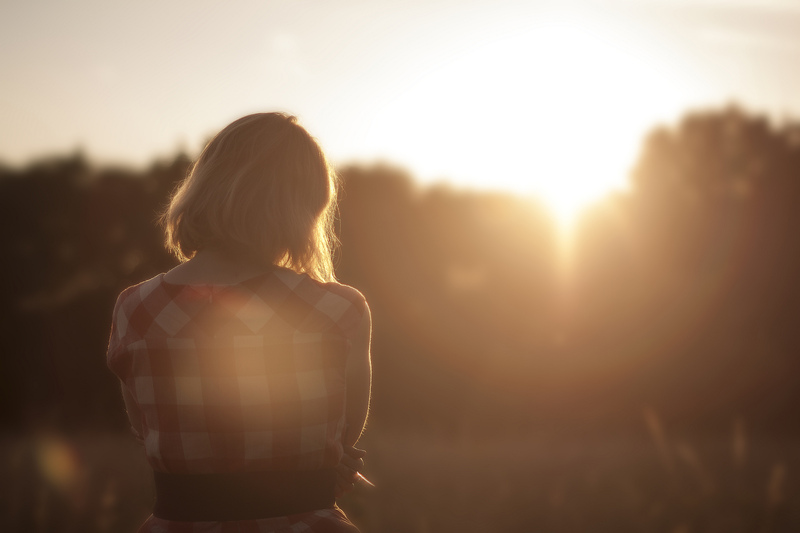 The problem is you have no idea where someone else’s story began or how far along they are on their journey. Your super-skinny friend may not have been that thin a year ago, and your super-successful network marketing friend who is quickly climbing the ranks of her MLM didn’t start out at the top – she started down at level one just like everyone else. If you are just beginning a new journey, whether to a smaller waist, or a larger paycheck, or to starting a new business – just remember that your journey is YOUR journey and GOD is in control. He is the author of your life and your plans and instead of comparing your story or lack there of, start focusing on being thankful for what the Lord has given you. Be willing to learn and grow AND be content at every step of the way. You do that, and you’ll find joy all along the entire journey.